Amusei is an ambitious but not overly bright Argonian thief who dreams of making it big in the Thieves Guild. His journey towards this goal will be long and troublesome, and you will have to rescue him several times all across Cyrodiil as you progress through the ranks yourself. After one final life-threatening experience in Castle Skingrad, Amusei will finally be accepted into the Guild and will end up a highly esteemed member, delivering personal messages from the Gray Fox himself. 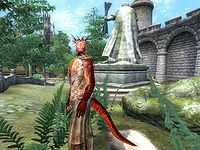 Like many Argonians before him, Amusei was born and raised near Black Marsh in Leyawiin but recently left his hometown to try his luck in the Imperial City. Being quite poor, his only possessions are his lower-class clothing and a bedroll, which he has laid out next to Puny Ancus' in the shack area of the Waterfront District. This is where you will meet him for the first time, wandering around the area all day long and, before you have joined the Thieves Guild, meeting up with guild doyen Armand Christophe and fellow prospective member, Methredhel, at 11pm in the garden of Dareloth every night. They will stay there until 3am or until a third competitor shows up. During the May the Best Thief Win race, he will do his very best to find the diary, but the confused Argonian will mistakenly end up in the center of the Talos Plaza District as he says, "Hmmm. Maybe he lives in the Elven Gardens district." and will stay there until either you or Methredhel delivers the diary to Armand. No matter who wins the first race, Amusei will not get a second chance. Rejected by the Guild and understandably disappointed, Amusei will then remove his bedroll from the Waterfront, leave the big city, and travel all the way back to Leyawiin to try his luck as a freelance thief. He will settle down in the southwestern part of town and place his bedroll in the high grass near the statue of Torval the Pilot. Once settled, he will wander aimlessly all hours of the day, without ever eating or sleeping. When you have received instructions from S'krivva during the Ahdarji's Heirloom quest, he will relocate to a cell within the Leyawiin Castle Dungeon, and it is up to you to hand him a lockpick so he can get out. Once you finish the quest, he will return to the statue and live there until you receive instructions from S'krivva in the Lost Histories quest. He will then relocate to another prison cell, this time deep in the dungeons of Castle Skingrad, as potential prey for the Pale Lady. After a dramatic escape, he will provide you the necessary information about the book Lost Histories of Tamriel and then just stroll around in downtown Skingrad until you finish the quest. After this life-threatening experience, Amusei wisely retires from freelance thievery and travels all the way back to the Imperial City where he finally gets a break in life; he is accepted into the Thieves Guild where he starts out as a Pickpocket. His life will not change much, though, as he will still hang out in the Waterfront District and wander around 24 hours a day. When you reach the quest Arrow of Extrication, Amusei will have made a career within the Guild and will actively seek you out in all major cities (with a few exceptions), as a messenger for the Gray Fox and initiate the quest for you. Similarly, he will also start the quests Boots of Springheel Jak and The Ultimate Heist. After you have finished the questline, Amusei will change his behavior from Tirdas to Fredas and spend his evenings, from 6pm until 2am, inside Dareloth's house, hanging out with the other guild members. For a detailed description of Amusei's adventure, including all of his dialogue, see this section. Amusei starts out wearing lower-class attire consisting of a pair of coarse linens, a huntsman vest, and a pair of huntsman moccasins. He carries an iron shortsword and a few gold coins. After joining the Guild, he upgrades his outfit to a leather cuirass and greaves, and his weapon to a steel shortsword. When he is behind bars in Leyawiin, he will wear the usual prison attire, a pair of pants with a shirt and shoes. 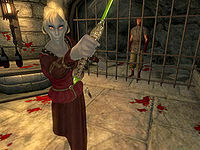 During his encounter with the Pale Lady in Skingrad, he will wear the same prison attire, excluding the shoes. He knows a leveled set of rogue spells from the school of Illusion, specifically leveled Chameleon, Invisibility, and Silence spells. At the beginning of Taking Care of Lex, both stages 0 and 10, he's upgraded to Footpad. At the beginning of Turning a Blind Eye, stage 0, he goes up to Prowler but at stage 10, he is demoted to Bandit. At stage 100 he is promoted back to Prowler. At the beginning of Boots of Springheel Jak, stage 0, he skips back up to Shadowfoot... and is bumped back down to Cat Burglar at stage 10. At the beginning of The Ultimate Heist, stage 0, Amusei is bumped up to Master Thief and once again bumped back down a level to Shadowfoot at stage 10. In the Garden of Dareloth, you will encounter Amusei, Methredhel, and Thieves Guild doyen Armand Christophe. If you approach Amusei at this point, he speaks to himself about the situation: "I see there are too many thieves in the city." If spoken to, his excitement about being given the chance to join is obvious: "You wish to join the Thieves Guild too? Maybe we will soon be brothers in the shadow. Only Armand can say." However, when Armand reveals there is a competition coming up, a race for a diary written by Amantius Allectus, Amusei will sense his upcoming failure and object: "That's not fair!" After the rules have been laid out, Methredhel will run away from the garden while the confused Argonian will just wander towards the Talos Plaza District without a clue, at times mumbling to himself: "Hmmm. Maybe he lives in the Elven Gardens District." If you try to speak to him while he is trying to figure out what to do, he will still be keen on winning the race: "Step aside! I'm going to win the right to join the guild. You can't beat me." If Methredhel wins the first race, Amusei will stick around in the Imperial City, hoping for another chance, but Armand will reject him: "Amusei is a bungler and won't get this offer." When you are accepted into the Guild, Amusei will pack up and leave for Leyawiin. Telling Ahdarji after breaking out Amusei but before getting the ring that he attempted to blackmail the countess will yield a typically mean remark: "Amusei tried to sell it to Alessia Caro? Argh! Stupid lizard. Ahdarji uses ring much more wisely. I use it to collect and sell information. That ring can be used to read private messages the Count writes. Get me that ring. Steal it from Alessia Caro if necessary. Just bring me the ring. I will pay double!" When you go to S'krivva to get orders for Misdirection, Amusei will have spoken to her previously and she will say: "Amusei sends his regards." After losing the race, and his chance at membership in the guild as a result, a disappointed Amusei returns to his hometown of Leyawiin, hoping for a career as a freelance thief. Unfortunately, it does not take him long to mess up and land himself behind bars. When explaining the quest at hand, S'Krivva will mention Amusei, although not by name: "A street scavenger made off with a ring that the widow Ahdarji values highly. She is offering a reward. The guild frowns on freelance thieves. Are you willing to go to Leyawiin, find the ring, and get it back to Ahdarji?" When you arrive in Leyawiin, Ahdarji will show her distaste for Amusei and his race, "Yes. A filthy Argonian stole my precious ring. It was a gift from my mate. It has... sentimental value. I will pay well. The stupid lizard hunts with the name Amusei. Find him, find my ring. Make him suffer! Kill him and I will be pleased." When reminded of the Guild rules against murder she will say: "Stupid guild rules! He is only an Argonian. He is less than human, and much less than Khajiit. If you must spare him, at least make him suffer." If you ask the beggars about his whereabouts, they will tell you, "The poor bugger was arrested. Seems he tried to swindle the Countess. He's rotting in a cell in the castle dungeon now. It's common knowledge that the jailors can be bribed to allow visitors to see prisoners." When you ask a guard about him, he will be less empathetic: "We arrested that miscreant. The stupid lizard tried to blackmail the Countess. I wouldn't waste much time thinking about him any more." When you bribe a jailor to let you see Amusei, he will give you access with a joke: "Amusei you say? I thought you wanted to see Amuday. He's off limits. Amusei though is just down the hall. Make it quick." 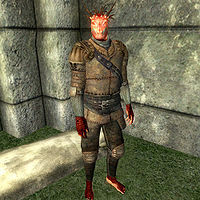 From his prison cell, Amusei will inform you of his story: "The Thieves Guild refused to take me, so I came here. Leyawiin is my home. It is where I was raised. I went to the Imperial City in hopes of joining the Thieves Guild. Now I am forced to live as a freelance thief." When asked about Ahdarji's ring he will reply: "Why should I tell you where it is? Here I sit in Leyawiin's dungeon while you are free. What will you do for Amusei if I tell you?" Three options are available at this point; if you promise him to put in a good word for him he will decline: "You mean with the Thieves Guild? Sure, that way I'll be a member in a good standing when they put my head on a pole! Are you an idiot? I want you to get me out of here! I don't want a stinking guild membership." He will also decline if you offer him a cut of the reward: "And what good will money do me when they come to stretch my neck? Find a way to get me out of here. Then we'll talk. Besides, you're a thief. You'd just sell the ring and let me swing." If you offer him a lockpick, he will be much more interested: "You'd do that for me? Maybe you guild types aren't so bad after all. Okay. It's a deal. Give me a lockpick and I'll tell you about the ring." If you are out of lockpicks he will say: "Well, what are you waiting for? Go get some! I'm not tellin' you a thing until I've got one in my hand." When you hand over a lockpick he will be grateful and tell you the whole story as well as revealing how he ended up in the dungeon: "Sunlit freedom! Yes, I stole that ring from Ahdarji. When I went to sell it, the fence told me I was too hot for him. He showed me an inscription on the inside, 'To Alessia.' That had to be the Countess of Leyawiin. The damn ring was stolen property! Well, I figured I would ransom it back to the Countess. Except she tricked me. I was arrested for theft, and she kept the ring. The Countess rarely leaves the castle. Good luck getting it back." When you get close to him, Amusei will now give you a unique, and rather disgusted, greeting: "Ah, the Thieves Guild's new favorite." He will however now say goodbye to you with, "I owe you a debt of gratitude." During the Lost Histories quest, the unlucky Argonian will once again be behind bars, this time in the depths of Castle Skingrad. Early in the quest, imprisoned beggar Larthjar the Laggard will tell you about disappeared Cat Burglar Theranis, the mysterious Pale Lady, and a certain Argonian. On Theranis he will say: "You mean the thief? He was in the big cell with that Argonian. They were always whispering to each other. The Pale Lady took him days ago. She took the Argonian less than an hour ago though. He put up quite a struggle. He was bleeding all over the place." With the dead body of his cellmate Theranis lying nearby and the Pale Lady wandering around, Amusei is understandably upset inside his cell in the Wine Cellar. When you approach him, he may cry out, "Help!" When you speak to him, he will show his concern about the situation: "We need to get to safety." 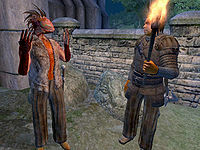 If you ask about the Argonian prisoner, he will tell you what is obvious and that his crime was merely an attempt to get something to eat: "That would be me. I am so glad you are here to save me from the vampire! 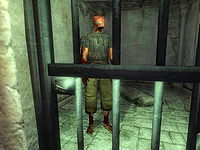 Those cretin Skingrad guards caught me stealing a fish and locked me up. You have saved my life, again. You are a true friend. I will not forget this. I've decided to join the Thieves Guild. No more jails for me!" When asked about Theranis, he will say: "Theranis? How did you know about him? He was my cellmate. At least until the Pale Lady took him away." When asked about the book, he will say: "No. But he did give me a message about a treasure to deliver to the Thieves Guild if I was ever to get out. After the first time Theranis was taken by the Pale Lady, he knew he was going to die. Get me out of the castle and I'll give you his message." When asked specifically for the Lost Histories of Tamriel, he will cut you a deal: "If that's Theranis' treasure, I know where it is. But I'm not telling you anything until we're out of here. Get me out of the castle. As soon as we are out of sight of the castle's main gate, I'll tell you." About the Pale Lady, he will only say: "Filthy vampire! She took my cellmate Theranis a few days ago. If it hadn't been for you, I would have been next." He will then proceed to wander around his jail cell until you rescue him. When you start the escape, Amusei will receive a disposition boost of 15 towards you. During your escape with Amusei, he will follow you always in sneak mode, unless he gets too far away, at which point he will run to catch up. He will also become a part of the Escaped Prisoners faction until you pass the courtyard of the Castle at which point he will get another 15+ disposition boost. After the dramatic escape, he will provide you the necessary information about the book Lost Histories of Tamriel: "Anything for my savior." If you ask about the book, he will be true to his word and give you the information you need: "He told me to give this message to any member of the Thieves Guild that asked about him or a book. 'Look under the bush near the well, behind Nerastarel's house.' I was going to take it for myself, but I owe you a great debt. You should take it." Once you have the book he will now say to you when approached: "You are a welcome sight!" Note: While you are doing Turning a Blind Eye for the Gray Fox, Amusei will be heavily promoted within the Guild; he now acts as the personal messenger for the Gray Fox and will, when you have fenced the required amount of gold, seek you out in all the major cities. There's a few exceptions though; he will never seek you out while you're in jail or when you are in the Dark Brotherhood Sanctuary. Additionally, he will never seek you out in the same city where you are supposed to meet the Gray Fox. See the sections below for details. After you have fenced 700 gold and received a quest update in the Independent Thievery quest, Amusei, now a Cat Burglar in the Thieves Guild, will actively seek you out in all major cities, with the exception of Chorrol. When he recognizes you he will proudly deliver a message from the Gray Fox: "It is good to see you again! I have a message for you from the Gray Fox." Inquiring about the message leads to him elaborating: "The Gray Fox has a task for you. Meet him at Malintus Ancus' house in Chorrol." When you ask him if he joined the Guild, he will thank you with all his heart: "Yes, I did. After you saved me in Castle Skingrad, I vowed to join. I was having no luck on my own. Now I am running errands for the Gray Fox himself. I owe you much for your help." He will then proceed to walk away. If you approach him again he will say: "I am honored to be entrusted by the Gray Fox himself to run these errands." After finishing conversation, Amusei will now use the unique farewell: "May Shadow hide you." When you approach him he will now say to you, "Old friend!" After you have fenced 800 gold, Amusei will have gained the rank of Shadowfoot within the Guild and will once again seek you out in all cities (Cheydinhal excepted) with a message from the Guildmaster: "I have another message from the Gray Fox. You must be very important!" When you inquire further he will say, "The Gray Fox requests a meeting. Please travel to Ganredhel's house in Cheydinhal." His new dialogue when you approach him is, "Well met, old friend!" Amusei will also trigger the very last quest of the Thieves Guild. After you have fenced 1000 gold, the once poor Argonian will rank as Master Thief and will, if you are anywhere but the Elven Gardens District, contact you one last time: "I have another message from the Gray Fox." He will then point you towards the Gray Fox for the final quest: "The Gray Fox requests a meeting. Please travel to Othrelo's [sic] house in the Imperial City Elven Gardens." If approached again, he will still be very happy to see you, saying: "It is good to see you again." If spoken to, he will now use the unique greeting: "You are looking well." A serious bug involving Amusei can prevent you from ever joining the Thieves Guild and destroy the entire questline. If you visit Castle Leyawiin and pick the lock of the last cell in the Dungeon before having joined the Guild, Amusei will relocate to the dungeon and be forever stuck, preventing you from starting the May the Best Thief Win quest. If you pick the lock later on (e.g if you feel sorry for him during Ahdarji's Heirloom), the bug will not destroy the questline but will ruin Amusei's entire schedule, as he will travel back to the dungeon in sneak mode every time he finishes his involvement in the many quests, at times causing problems when he is supposed to deliver messages from the Gray Fox. The reason behind this is that Amusei's script relocates him to the prison when the door is unlocked without checking to see if you have started or finished Ahdarji's Heirloom. Amusei was supposed to sleep in the Waterfront District between 6am and noon and in Leyawiin and Skingrad between midnight and 6am. This never happens because his wander package takes precedence over his sleeping package. If you use the wait feature near any of his bedrolls, with the exception of Skingrad, Amusei will always be sleeping but will immediately start his wander package. After S'Krivva thanks you during Ahdarji's Heirloom (stage 80), Amusei is erroneously given Thieves Guild-related leather equipment instead of his original lower-class attire. At the beginning of Lost Histories, when he is behind bars in Castle Skingrad, this is removed in favor of jail attire. After The Ultimate Heist, Amusei was supposed to visit Dareloth's house on Tirdas and Turdas only. He visits the house four days in a row because the package runs past midnight, in the process messing up the days for the AI. Amusei was supposed to move to Skingrad at Stage 80 of Ahdarji's Heirloom and he will also relocate there, with his bedroll conveniently placed behind Ambroise Canne's house as planned. Unfortunately, his AI mistakenly points to the last location he slept in and as a result, he will travel right back to Leyawiin and live there until Lost Histories is initiated. Due to a small mistake in the game script, Amusei will pick up his in-jail greetings ("Help!" and "We need to get to safety.") right after Misdirection, even if he is still living in the streets of Leyawiin. This page was last modified on 18 October 2018, at 10:21.